When TCP sends a segment it maintains a timer, waiting for the other end to acknowledge reception of the segment. If an acknowledgment isn't received in time, the segment is retransmitted. To compute the current RTO, a TCP sender maintains two state variables, SRTT (smoothed round-trip time) and RTTVAR (round-trip time variation). When segment 4 is transmitted 2.4 ms later, it cannot be timed, since the timer for this connection is already in use. 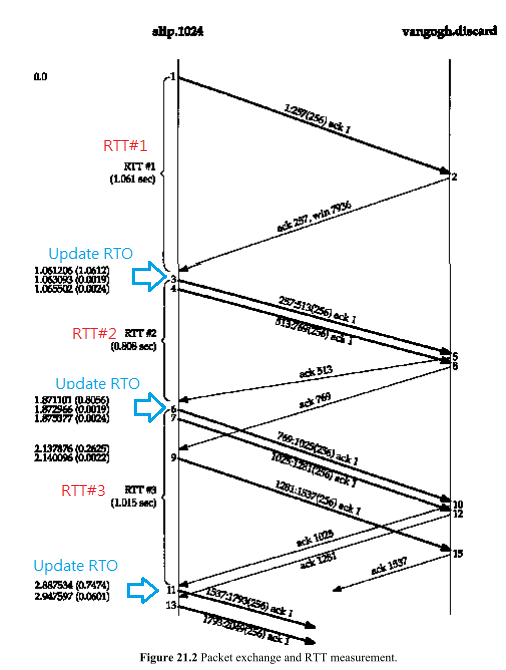 (5.3) When an ACK is received that acknowledges new data, restart the retransmission timer so that it will expire after RTO seconds (for the current value of RTO). upper bound to this doubling operation.